Move over Clapotis, there's a new fad in town. 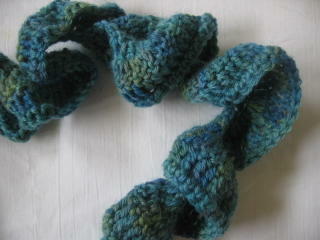 Oh yeah, it's the curly whirly scarf. Now I know this isn't an original idea or pattern (so I'm not claiming this as my own) but I wanna thank Yvonne and Ann (who in turn wants to thanks Sue) for their inspiration and thoughts on this. It's one of those fun things to make, that even beginners can manage easily.. and when you realise how it's done you kinda go 'oh yeah...' as the penny drops, realising that all it is is a great big frill. 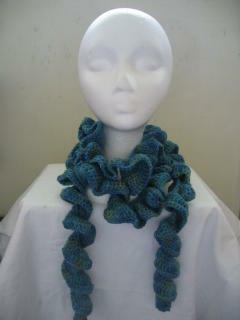 Instead of kntting/crocheting a scarf the conventional lengthways, you're making this one widthways. So let's rock on and have a peep at how it can be done; either knitted or crocheted. Ok, now some patterns start at the frill edge and knit in - a bit daunting casting on somewhere between 400 & 700 stitches - sod that! Also, that method requires an exact amount of yarn - bit of a bummer running out before you finish the neck edge, eh? So I did mine the other way round. Far better to keep going until you run out of yarn, and just finish there. The only difficulty was the first few rows of increase - got a bit tight on the needles. Also, you can't really tell how frilly it is until it comes of the needles... but hey, better that than trying to count out several hundred stitches, don't you think? Row 1 - Knit to end. Repeat these two rows once more. Voila, one scarf. Easy peasy lemon squeezy. Now, you can use just about any yarn. Just check the recommended gauge and cast on the amount of stitches you need for the desired length. Knit until you run out of yarn, adding an extra skein if necessary for a fuller width. This one came out at nearly 3", which is fine as an accessory rather than a fully functional neck warmer. But hey, they look cool whichever width you go for. 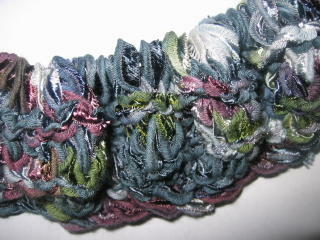 Now, I did this one first and ripped it out a few times 'til I'd got the frill curling just right. 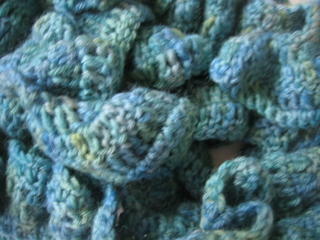 I also used a completely different yarn and hook size. Just goes to show how versatile this thing is, if you ask me. The only draw back for me was when I ran out of yarn, I kinda wanted it wider - only had one skein of the variegated yarn - so may well hunt down something that coordinates and add an extra row or two of trebles. Row 5 - DC once into each chain. Now, personally I reckon a few more rows of normal trebles after row 4 would make a nicer width; more body. I'd also use a larger hook if starting again, make it more lacey and fluid. I did the last row in DC's just to give a finished edge (and that's all my yarn would allow me!) As I said, I may well find a coordinating yarn and let it grow a bit. That's the nice thing about the crochet version; it's easily added to with out undoing the cast-off row.